Superbike riding dynamics and powerful, emotive roadster styling – these are the hallmarks of the new BMW S 1000 R. The new naked bike from BMW Motorrad is directly derived from the S 1000 RR superbike and uses the same innovative technology. The close family resemblance to the "RR" is instantly obvious. The pared down appearance of the new S 1000 R exudes an aggressive, dynamic energy. Based on a well-thought-out overall concept, with 160 hp maximum power and a weight of 207 kg, as well as Race ABS, ASC and a choice of two riding modes as standard, the BMW S 1000 R sets new standards in the sports roadster segment. In-line four-cylinder engine with optimised low to mid-range performance. When modifying the S 1000 RR's 999 cc four-cylinder in-line engine for use in the S 1000 R, the engineers were looking in particular to provide punchy response all the way through the rpm range. To provide the ideal set-up both for everyday use and for sporty riding on the open road, they significantly increased the low and mid-range power and torque. At the same time, maximum rpm has been reduced by approximately 2,000 rpm. Maximum power of 118 kW (160 hp) is reached at 11,000 rpm and peak torque of 112 Nm (approx. 83 lb-ft) at 9,250 rpm. Up to 7500 rpm, this engine version develops 10 Newton metres (approx. 7 lb-ft) more torque than the S 1000 RR. This provides punchy low-end response that is ideal on twisty single-carriageway roads. Among other things, this was achieved by using redesigned cylinder head ducts, modified cam profiles and appropriately modified engine management. The new BMS-X engine management system also supports an E-Gas "throttle-by-wire" system. For optimal adaptation to different conditions and rider requirements, the S 1000 R comes with two riding modes and ASC (Automatic Stability Control) as standard. The "Rain" and "Road" modes cater to different road surface conditions using different power and torque curves, and applying different levels of Race ABS and ASC intervention. This provides an important safety bonus, particularly under changeable road conditions. Dynamic Traction Control (DTC), incorporating a further two riding modes – "Dynamic" and "Dynamic Pro" – is available as an ex-works option. This option allows riders to make the most of the S 1000 R's sporty performance potential both on the road and on the race track. Dynamic Traction Control, which includes a banking angle sensor, offers safe and dynamic acceleration which is currently state-of-the-art for a production motorcycle. However ambitious the riding style, the chassis and suspension of the S 1000 R is a match for the dynamic power delivery of the four-in-line engine. Based on that of the S 1000 RR, it uses the proven aluminium alloy perimeter frame, in which the engine forms part of the load-bearing structure. As on the RR, an adjustable upside-down fork and a dual swingarm with adjustable central spring strut guide the wheels front and rear. Roadster-specific suspension requirements are met by a slight change in geometry. As on the RR, vigorous, stable and above all safe braking is provided by a braking system that comprises a twin-disc brake with two radial 4-piston fixed callipers at the front and a single-disc brake at the rear, with partially integral Race ABS. Dynamic Damping Control (DDC), available as an ex-works optional extra, offers the benefits of electronic damping control. For further enhanced performance, in combination with enhanced active safety, this system dynamically adapts the damping to the current riding situation with split-second speed. The new S 1000 R's sports roadster personality is also mirrored in the styling. 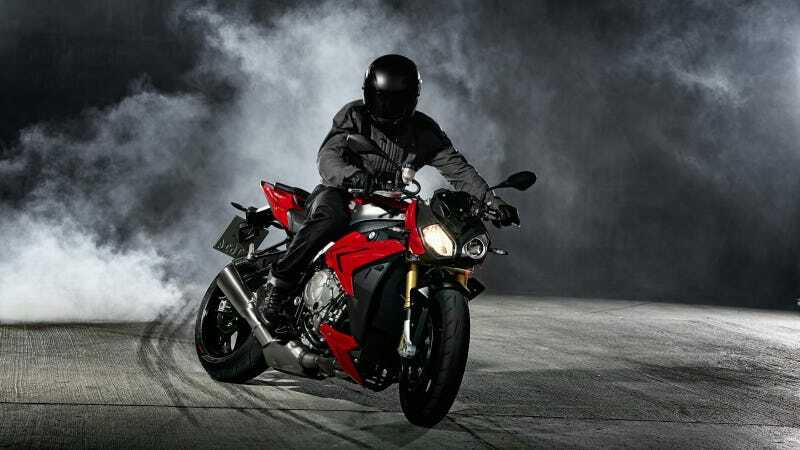 With its "tail up – nose down" stance, the S 1000 R's appearance immediately suggests aggressive performance and dynamism. Like the RR, the S 1000 R, too, is distinctive and instantly recognisable. It has a face that stands out in a crowd. Last but not least, race-inspired features also extend to the cockpit of the S 1000 R. With an LC display with analogue rev counter, the instrumentation offers an unrivalled amount of information in this segment, from the gear display and riding mode display to a lap timer. For optimal gear changes, an individually programmable quick-shifter is fitted. Well-thought-out overall concept sets new standards in the sports roadster segment. Pared down styling with an aggressively dynamic look; clear family similarities with S 1000 RR. 207 kg kerb weight with full fuel tank. Standard-fitted Race ABS for superior braking performance and safety. Standard-fitted ASC (Automatic Stability Control) for safe acceleration on surfaces with variable grip. Choice of two standard, rider-selectable riding modes, "Rain" and "Road". Optional Dynamic Traction Control DTC including Riding mode Pro maximises both riding enjoyment and active safety in all road situations. Optional Riding mode Pro comprising two additional riding modes – "Dynamic" and "Dynamic Pro" – for road and track use. Full synchronisation of Race ABS, ASC/ DTC, DDC and engine management. E-Gas system for optimal throttle control and maximum reliability. Aluminium fuel tank brings further weight savings and is unique in this segment. Infectious handling with highest standards of stability at high speeds and when braking.